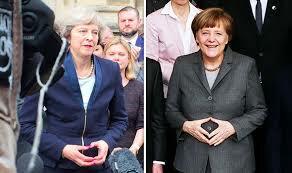 I just saw the the picture of May and Merkel standing side-by-side [first attachment] and thought "what unusual hand gestures they both are displaying." - It must be just a coincidence. Then I recalled that Angela Merkel often holds her hands like this, and upon checking she does it so often it has been not only identified as her 'signature' pose, but has been named the Merkel-Raute. Looking further into this, Therese May often holds her hands in this same way too. Two Western 'leaders' flashing trademark hand symbols? One has struggled mightily to destroy Germany by enabling and embracing the Islamic Jisrah (invasion) which is absolutely NOT a good thing for the German people, nor is it the will of the people. The other has struggled mightily to destroy BREXIT which is absolutely NOT a good thing for the British people, nor is it the will of the people. I've heard it said its a symbol of those dedicated to the Coudenhove-Kalergi plan or something to do with the Charlemagne group. When you are owned by Davos and the Bilderbergs, you surely know how to show your appreciation for their support! It's a common thing for people to do when pensive. Nothing nefarious about it.